Gareth Huw Davies - Could Anglo-Saxon Lenborough Hoard lift a county's tourism? Could Anglo-Saxon Lenborough Hoard lift a county’s tourism? 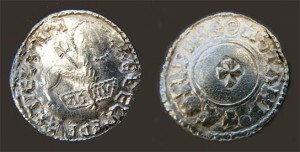 Coins from Anglo-Saxon Hoard from Lenborough, Buckinghamshire. Buckinghamshire, my adopted county, is a place of minor, restrained tourist attractions. The Chilterns are its main landscape asset, a quiet conglomeration of hill and valley and wood. Not so tall and commanding, but appealing on a small scale, and very convenient to London. There are many attractive small market towns, their old hearts preserved (more or less), and important National Trust properties. Famous figures who lived here, such as Roald Dahl, are suitably celebrated. There was no “you must see this” feature to instantly define the county to the tourist. Until, that is, a metal detector gave off an urgent high pitched whine over a field at Lenborough in the north of the county just before Christmas, 2014. Something valuable and rare buried there for almost a thousand years could be about to become that crowd-pulling attraction. The unearthed cache of 5,251 coins, protected inside a lead sheet, turned out to be the largest Anglo Saxon coin hoard discovered since the Treasure Act took effect in 1996. There is a strong chance it can pass to the Buckinghamshire County Museum in the county town Aylesbury, to be put on permanent display. The coins of the Lenborough Hoard, depicting the heads of kings Æthelred II (the Unready 978-1016) and Cnut (Canute,1016-35), were buried towards the end of Cnut’s reign. They are all silver pennies, save for two cut half pennies, and come from 40 different mints around England. They are still being catalogued by the British Museum, but the county coroner has given permission for “about 20 coins” to be displayed at the County Museum before the inquest is heard. Some coins from the hoard were put on display at the British Museum in February (2015), coinciding with the launch of the annual Treasure Report. Under the Treasure Act 1996, the local Buckinghamshire coroner, at an inquest, must determine whether the find constitutes treasure or not. If it is declared treasure, the owner must offer it for sale to a museum at a price set by an independent board of antiquities experts. This is the largest Anglo Saxon coin hoard discovered since the Treasure Act was introduced, and it could could be worth up to £1.3m. The find was made by Weekend Wanderers Detecting Club member Paul Coleman, from Southampton, on 21 December 2015 at a detectorists’ rally. It was wrapped in a lead sheet, presumably buried in the ground for safekeeping. Protected against the elements, the find very well preserved. With coins from around 40 different mints in England, the horde provides a rare source of information on the circulation of coinage from that time. The museum in Aylesbury, 16 miles from where the find was made, is the obvious choice for the place to display them. It has already launched an appeal for pledges to assess the amount of local support there is. Funding bodies are said to be impressed if they see significant local support for an acquisition. Bob Sutcliffe, of Buckinghamshire County Museum, commented: “This is an incredible find for Buckinghamshire. Someone in the now-tiny village of Lenborough had stashed a massive amount of money almost 1,000 years ago, and we want to know who and why. Previous PostStart-ups offer smart solutions for our climate-stressed times	Next PostA message to the future – why were we so quiet about climate change?